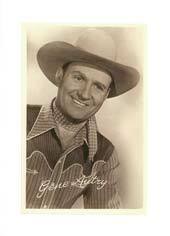 Make someone's day a little brighter with a handwritten note on a Gene Autry note card or just say "Howdy!" 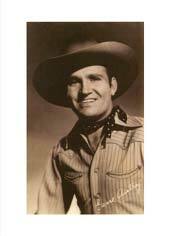 on a Gene Autry post card. Each note card is blank inside and comes with an envelope. All items sold individually. Reproduction of lobby card from Gene Autry's 1941 film Down Mexico Way. Reproduction of lobby card from Gene Autry's 1939 film South of the Border. Reproduction of lobby card from Gene Autry's 1939 film In Old Monterey. Reproduction of lobby card from Gene Autry's 1939 film Mexicali Rose. Home of Gene Autry, North Hollywood California"
Note card reproduction of promotional postcard of Champion and Gene Autry with signature salutation. "Blue-Toned Gene Autry with Guitar"
Note card reproduction of blue-toned vending machine postcard of Gene Autry with his guitar and signature salutation. 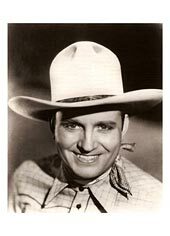 "Black and White Smiling Gene Autry"
Note card reproduction of black and white vending machine postcard of a smiling Gene Autry with his signature. "Black and White Handsome Gene Autry"
Note card reproduction of black and white vending machine postcard of a handsome Gene Autry with his signature. 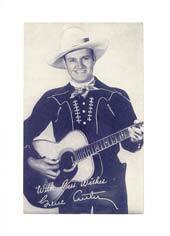 Note card reproduction of color-tinted photo of Gene Autry with his name below the image. "Gene Autry and the Cass County Boys"
Post card reproduction of black and white photo of Gene Autry singing with the Cass County Boys. Post card with portraits of cowboy heroes from the movies. 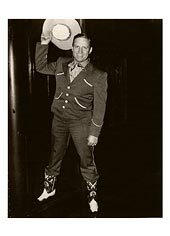 "Gene Autry and His Cool Cowboy Clothes"
Post card reproduction of black and white photo of Gene Autry playing guitar while surrounded by his western boots, stylish shirts, and other cool cowboy clothing items. 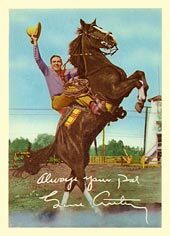 "Color-Tinted Gene Autry on Rampant Champion"
Post card reproduction of promotional color-tinted postcard of Gene Autry on rampant Champion with signature salutation. 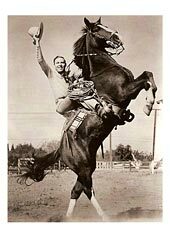 "Black and White Gene Autry on Rampant Champion"
Post card reproduction of promotional photo of Gene Autry on rampant Champion. 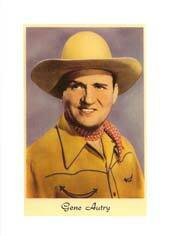 Post card reproduction of color photo of Gene Autry. 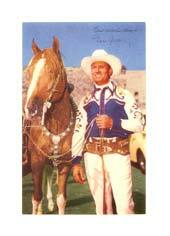 "Color Gene Autry on Champion"
Post card reproduction of color photo of Gene Autry in the saddle on Champion. 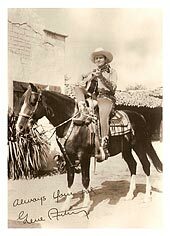 "Black and White Gene Autry on Champion"
Post card reproduction of black and white photo of Gene Autry in the saddle on Champion with signature salutation. "Black and White Standing Gene Autry"
Post card reproduction of black and white photo of Gene Autry standing and waving his hat. 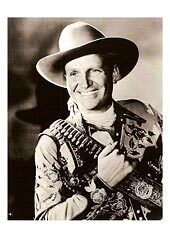 "Black and White Gene Autry with Bullet Belt"
Post card reproduction of black and white photo of Gene Autry with bullet belt on his shoulder. 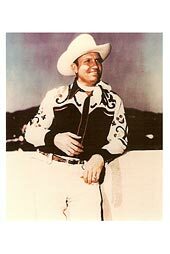 "Black and White Gene Autry in Horse Shirt"
Post card reproduction of black and white photo of Gene Autry wearing his horse shirt. "Black and White Early Gene Autry Portrait"
Post card reproduction of black and white photo of an early Gene Autry portrait circa 1935. 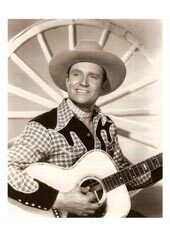 "Black and White Gene Autry – Which boots today?" 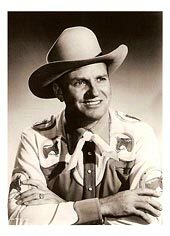 Post card reproduction of black and white photo of Gene Autry who seems to be asking himself, "Which boots should I wear today?" 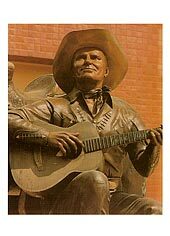 "Color Close-Up of Gene Autry Statue"
Post card with close-up image of the Autry Museum's Gene Autry statue. "Black and White Gene Autry with Wagon Wheel"
Post card reproduction of black and white photo of Gene Autry playing guitar with a wagon wheel behind him. "Gene Autry's Hand and Footprints at Grauman's Chinese Theater"
Post card of Gene Autry's hand and footprints, as well as Champion's hoofprints, at Grauman's Chinese Theater in Hollywood, California.